I-Ching Li is the youngest concertmaster in the history of the National Symphony Orchestra. Her extraordinary musicianship and artistry has been recognized throughout the world. Her virtuosic performances had garnered her top prizes at numerous competitions in the States and Asia, both as a soloist and chamber musician. Most recently, she won the Outstanding Artist Award presented by the National Tsing Hwa University. 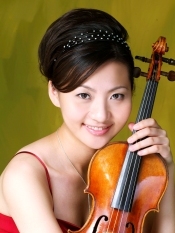 Ms Li has been performing throughout music festivals a soloist, concertmasters, and orchestra section members all over the world, including Tanglewood Music Festival, Pacific Music Festival, Sarasota Summit Music Festival, Scheleswig-Holstein Orchestral Academy, Banff Music Festival, and many others. She was honored to have worked with great maestros such as Seigi Ozawa, James Levine, Christopher Echenbach, Eksabela Solemann, Wen-Pin Chien, and among others. She is excited about the prospect of developing her skills as an artist and collaborating with musicians both locally and abroad.